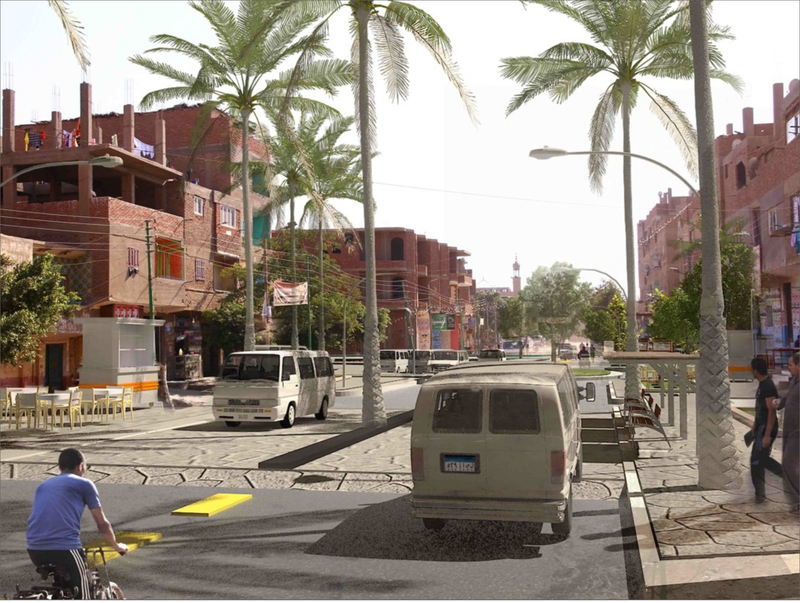 This project aims to present a new model of urban development in Egypt. It came in the midst of unique political circumstances that we attempted to capitalise on and represent. The project, which took place at the village of Al-Kom Al-Ahmar, was a pilot example for other projects to follow. The group of architects who stand behind it worked under the name of Madd Platform; an urban initiative that we co-founded in 2011. The project, as well as the initiative, aim at an equitable built environment through capturing existing modes of living and involving a wider range of stakeholders. Al-Kom Al-Ahmar is a small village located to the west of Cairo. Like most Egyptian villages, it witnessed a rapid urbanisation and a transformation of the socio-economic structure in the past few decades. This resulted in a great expansion of the built area at the expense of agricultural land, and high-rise buildings with unfinished façades. 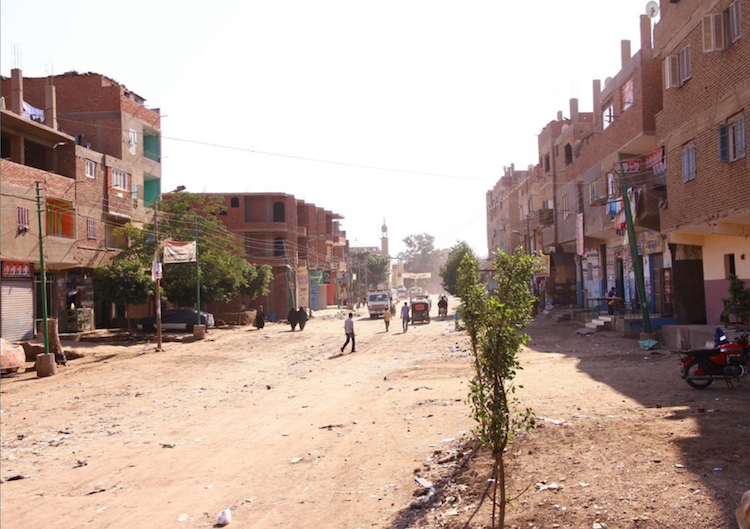 The village’s proximity to Cairo amplified this condition, gradually washing out its rural character. Many residents now rely economically on Cairo either by directly working there or by working in the village as car mechanics serving the capital’s car owners. Another feature recurring in the Egyptian countryside is the covering of irrigation canals, and this is due to many reasons, including the decline in agricultural activities. Al-Kom Al-Ahmar was no exception. The canal was recently covered, leaving behind a 30-meter wide avenue of undefined space running over an entire mile. Such spaces are usually left for individual interpretations, where informal shops or microbus stations pop-up. If the government intervenes, it usually simply paves the whole area with asphalt, which doesn’t sufficiently provide many urban qualities or respond to the community’s needs. This hadn’t yet happened at Al-Kom Al-Ahmar, but the new space was gradually being occupied by car mechanics’ workshops, cafes, microbuses and other light structures. This wasn’t ideal for the village though. The road was bumpy and dusty, which discouraged private car owners from visiting the workshops. It also wasn’t very safe to walk along its paths, nor was it well-kept. On the other hand, the community was short of some services, and the village’s public space didn’t generally accommodate some segments of society, like girls, very well. Seizing the opportunity of the 2011 uprising, our team attempted to present a new model of urban development, countering the common and the governmental practice and improving it. We established an initiative under the name Madd Platform; a collective of architects and researchers branching out towards other disciplines. Our projects attempt to prove the feasibility of a community-based participatory approach without excluding official stakeholders or businesses. Al-Kom Al-Ahmar was our first project. Our goal was to turn conflicts to mutual benefits, and to minimize the dependency on state solutions. We sought to achieve a socio-economic and sustainable user-based outcome to guarantee belonging and ownership of local inhabitants to the vicinity and its welfare. 1. 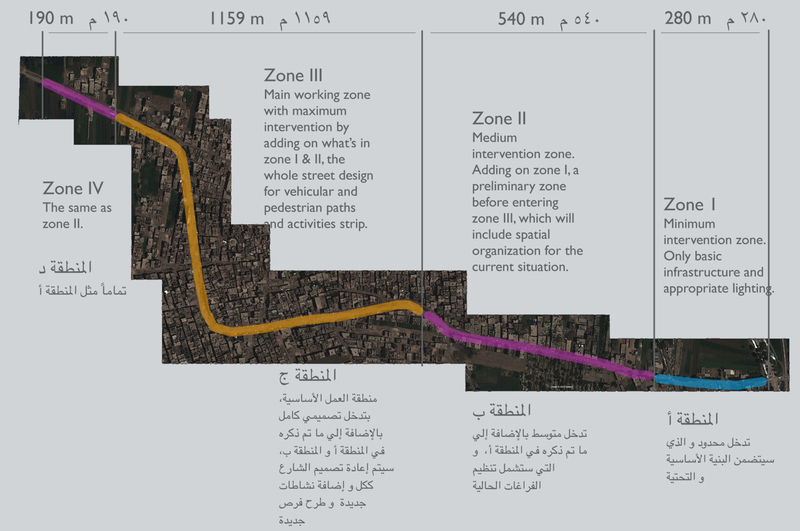 The base zoning plan classifying the canal area into homogeneous sections with variable levels of interventions. As a pilot project, we used it for testing our model. Some general guidelines for engagement were followed. Design was seen as a tool for negotiating claims and interests. People may not express their desires at the first instance; they may be cautious or ignore things they believe impossible to achieve. It was important therefore, to excavate the real reasons behind people’s complaints or demands; sometimes what they ask does not give away their real need behind it. It may be impossible to fulfil all needs, but everyone has to leave with some gain, i.e. the real reason behind the complaint or demand. It is also essential to recognise social relations and to not intimidate certain individuals or groups which may cause opposition. Our template comprised three phases: access, understanding, and reiteration. We started by forming an alliance with the local NGO ‘Al-Kom Al-Ahmar Local Development Organisation’ to give us access to the area and its people. A thorough urban and social research took place, including a detailed behavioural and territorial map along with individual interviews and group meetings. The objective was to develop a good understanding of the standing challenges, potentials and needs. Through the study, we grounded territorial influences of activities and users, upon which the project synthesised traversal patterns of usage; like mobility, services, production and leisure. The project then fitted other requested services in while trying to avoid conflicts of use along the road. The proposed ideas were iterated a couple of times by consulting community representatives in group meetings. A few points were revealed during the process, firstly, that the positioning of the research team is of high importance. Researchers have to be conscious about their promises; they should clarify their role as solely providers of alternatives and have to stress their inability to materialise any plans. Related to this, they have to remain politically neutral. Especially in the context of high political polarisation, which was the case at the time – different sides may easily oppose or endorse the project in response to its supposed affiliation with a political camp. Community members have various and sometimes conflicting interests in the designed space. Therefore, involving an insufficient number of people for representation could leave some segments unvoiced. It was always useful to ask more people across the demographic and professional spectrum. Finally, ideas shouldn’t be simply presented in drawings; researchers should also verbally describe the expected performance of the proposed space, which may easily pass unnoticed by the representatives. 2. Group meetings with the users’ representatives to receive feedback and suggestions, also acting as negotiation meetings between stakeholders mediated by the team. 3. 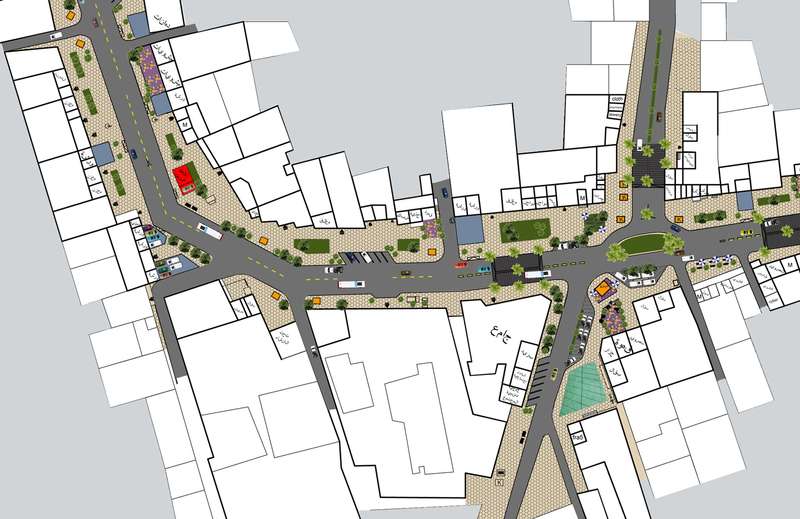 A detailed design sample for the main intersection. The proposal sought to compensate the shortages of central administration by distributing responsibilities. Based on communal consensus, users or groups were expected to look after some allocated spaces while respecting the others, and while leaving the street space dominantly public. For example, rights to use small outdoor car repair spaces were provided in front of each workshop. This was based on the current need – evident in the number and location of cars under repair on the street. Maintenance and overlooking of such spaces would be a task for each designated workshop. What was proposed is not access – which they already enjoyed – but the right to access and responsibility, hoping that this would contribute to the maintenance without encroaching so much on the public space. 4. A standard sample of the existing condition. 5. The proposed computer render for the same sample. Multiple sources of financing were thought of. The public funds available for paving can be redirected to follow the new design. Some project elements were to be financed by the direct beneficiaries, especially the small businesses. Revenue generating activities like the workshops will be requested to start paying ground rental fees for the spaces they occupy in the street in exchange of legalising their statuses. Any remaining expenses were planned to be paid by big companies as social responsibility. The project didn’t go unchallenged though. The proposal was presented to the governor deputy and the local administration, who responded positively. However, starting 2013, due to political instability, change of spirits in the country, and sometimes security issues, both civil servants and the community were unable or reluctant to pursue the project. Unfortunately, it was hard to escape the politically charged situation and to reassert the project’s neutrality at some points. However, the project is still valid and both Madd and the partnering NGO are willing to re-present it again to the community and the authorities at the first possible opportunity. Mohamad Abotera trained as an architect and has both a professional and an academic career. He finished his MA in Architecture, Globalisation, and Cultural Identity at the University of Westminster in 2007. Currently, he is a PhD candidate at the University of Antwerp with a project on hegemony and tactical urbanism. His activities include academic teaching and research, cultural project management, and architectural consultations. In 2011 he co-founded Madd platform; an architecture and research collective connecting with other grassroots’ movements to promote and experiment with new models of urban development. In his research he is interested in the political dimension of space, unplanned urbanism, representations and urban activism.